With a kilometer of pure sand and crystal clear waters, it has definitely earned its title and also has the rating as a “Blue Flag” beach. Armenistis is known as one of Greece’s greatest camping beaches. The view from the beach awards its visitors with a dominant Mt. Athos on the horizon. Our spot is situated right on the beach, easily accessible to everyone. It has ideal conditions for beginners in windsurfing with frequent thermal winds of up to 15 -20 knots, which are usual in May & June. 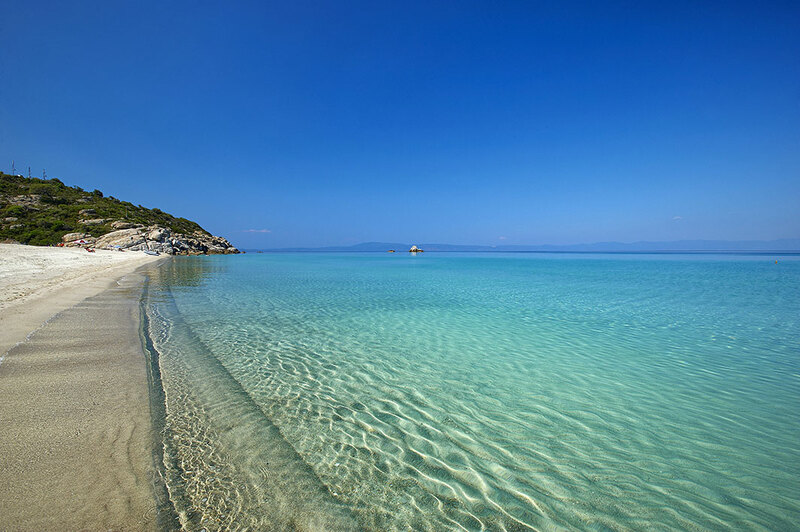 Also, it’s situated maybe in the most forested part of Halkidiki, which offers stunning views and magnificent little beaches along the coastline. The infamous Kavourotripes is a highlight of our sea kayaking & sup tours. Armenistis is wonderfully organized by the campsite that has the same name. There is a beach bar that cleverly enough doesn’t take up space from the beach and a restaurant where you can enjoy fresh seafood meals. Toilets, mini markets, coffee shops, you name it Armenistis has it all.